Tour Asakusa area on a peddle-powered rickshaw driven by a guide for 45 minutes before arriving at the Geisha Experience dinner that includes an authentic geisha performance and entertainment with multi-course kaiseki dinner and an English host/interpreter at a ryoutei (traditional Japanese restaurant) for a small group. If you're interested in learning about geisha culture in Tokyo, join us on our Geisha Asakusa Rickshaw Tour around the Asakusa and Sumida area of Tokyo. 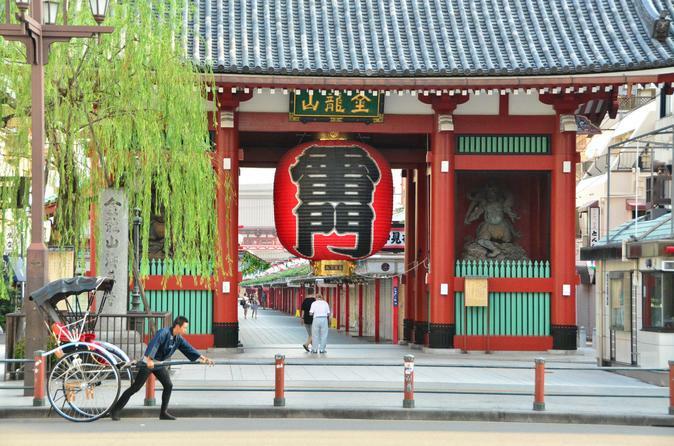 Ride a rickshaw around Asakusa where you'll see the Sensoji Temple and other historical landmarks, as well as the Kenban (geisha association) and Hanamachi (geisha district). Sit back and relax as your knowledgeable driver/guide peddles you past some of the city’s iconic sites, lovely gardens, towering skyscrapers and historic shops, passing cherry and maple trees as you go. It’s a great way to take a relaxed, informative, ride through this atmospheric area of Tokyo. After the 45 minute rickshaw ride around the geisha district and neighboring areas of Asakusa, you will arrive at a traditional Japanese restaurant (ryotei) where you'll join a small group and experience geisha entertainment with dance, music, and real conversations with geisha (English interpreter will be present to translate) and kaiseki (traditional multi-course) dinner. The dinner event will feature a certified geisha (also known as geiko in Tokyo) from the geisha district of Asakusa, Mukoujima or Omori Kaigan. The geisha (also known as geiko in Tokyo) are from the neighboring geisha district. In this delightful two hour dinner experience, the geisha will introduce you to the geisha culture of Tokyo, in which you will learn about the history of geisha and the geisha's personal experiences, watch geisha dance and other performances, as well as play traditional Japanese games with the geisha. Before you end the night, take photos with geisha to commemorate this special experience you had with them.